The soaring demand in semiconductor devices, batteries, gas sensor, microelectronics, heat transferring fluids, biomedical, photothermal and other application areas is driving the market growth. Owing to excellent optical, catalytic, photoconductive, mechanical and chemical properties, is fueling the market application across diverse end-user industries. Also, the rise in spending on research in the field of nanotechnology is further expected to spur the market growth in the following years. Rising demand from paints and coating industry owing to anti-bacterial, anti-fungal, and anti-microbial properties are also impacting on the market growth positively. The latest report by Value Market Research expects the Global Nano Copper Oxide Market to reach USD 260 billion by 2025. It was valued USD 97.8 million in 2018. The report foresees a 15% CAGR from 2019 to 2025. The electrical and electronics led the application segment in 2018 owing to its excellent physio-chemical properties. Growing disposable income coupled with rising demand for smartphones, laptops, tablets, and electronic gadgets are driving the segment growth. Geographically, North America dominated the market and has accounted for major market share in 2018. Soaring demand for smartphones, TVs, laptops, and smart home appliances is driving the regional demand. Robust industrialization backed by growing disposable income has generated huge demand for semiconductor devices are likely to contribute immensely in the regional market growth. American Elements, Hongwu International Group Ltd., Inframat Corporation, Ionic Liquids Technologies GmbH, NanoComposix, Inc., Nanoshel LLC, Nanostructured & Amorphous Materials, Inc, PlasmaChem GmbH, SkySpring Nanomaterials, Inc. and US Research Nanomaterials Inc. are some of the major players of the nano copper oxide market. As per this study the Global Nano Copper Oxide Market was valued USD 97.8 MN (by revenue) in 2018 and is anticipated to reach USD 260 MN by 2025 with a CAGR of 15%. Nano copper oxide is a brownish black colored powder that is insoluble in water but dissolves in dilute acid, alcohol and ammonia solution. Nano copper oxide particles release copper ions within the solution that increases the toxicity. Due to this, it is used as antimicrobial agent for inhibiting growth of wide range of microbes. Apart from this, it is used as rocket propellant, semiconductor, gas sensors, high-tech super conductors, etc. 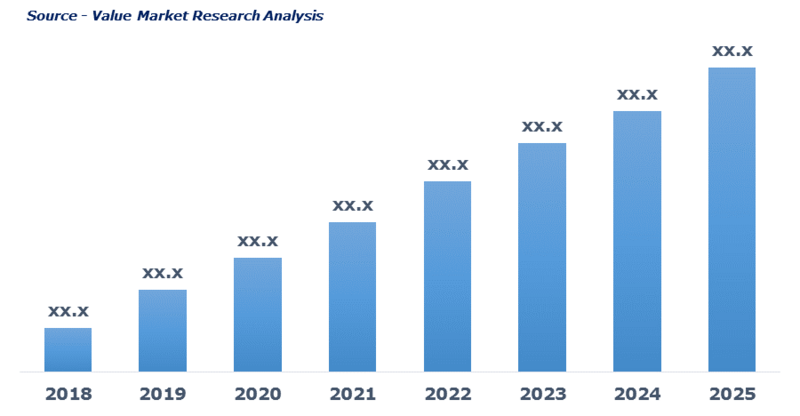 Rising usage of nano copper oxide in semiconductors, gas sensors, solar energy transformation, and photo thermal application is driving the market growth. Nano copper oxide offers better mechanical, anti-microbial, photovoltaic, catalytic properties are fueling the market growth. Whereas, high toxicity of nano copper oxide is likely to hamper the market growth. This detailed market study is centered on the data obtained from multiple sources and is analyzed using numerous tools including porter’s five forces analysis, market attractiveness analysis and value chain analysis. These tools are employed to gain insights of the potential value of the market facilitating the business strategists with the latest growth opportunities. Additionally, these tools also provide a detailed analysis of each application/product segment in the global market of nano copper oxide. The broad nano copper oxide market has been sub-grouped into application. The report studies these subsets with respect to the geographical segmentation. The strategists can gain a detailed insight and devise appropriate strategies to target specific market. This detail will lead to a focused approach leading to identification of better opportunities. Furthermore, the report comprises of the geographical segmentation, which mainly focuses on current and forecast demand for nano copper oxide in North America, Europe, Asia Pacific, Latin America, and Middle East & Africa. The report further focuses on demand for individual application segments in all the regions. The report also covers detailed competitive landscape including company profiles of key players operating in the global market. The key players in the nano copper oxide market include American Elements, Hongwu International Group Ltd., Inframat Corporation, Ionic Liquids Technologies GmbH, NanoComposix, Inc., Nanoshel LLC, Nanostructured & Amorphous Materials, Inc, PlasmaChem GmbH, SkySpring Nanomaterials, Inc. and US Research Nanomaterials Inc. An in-depth view of the competitive outlook includes future capacities, key mergers & acquisitions, financial overview, partnerships, collaborations, new product launches, new product developments and other developments with information in terms of H.Q. A combination of primary and secondary research has been used to determine the market estimates and forecasts. Sources used for secondary research include (but not limited to) Paid Data Sources, Company Websites, Technical Journals, Annual Reports, SEC Filings and various other industry publications. Specific details on methodology used for this report can be provided on demand. Nanostructured & Amorphous Materials, Inc.
* Kindly note that the above listed are the basic tables and figures of the report and are not limited to the TOC.
" Doing business with Value Market Research was – quick, easy and accurate. We got what we expected. The team was very helpful and processes were altered for our convenience. The whole process from understanding our niche requirements to delivery to after sales was excellent. " " Excellent work!! Working with you has been easy and direct. Your flexibility to alter the report scope and timely delivery assisted me in delivering my project proposal on time. " " This is our second purchase and we have been obliged by the service. We appreciate the efforts put by Value Market Research in terms of understanding our needs, expanding the scope of the study, delivery and handling after sales queries. " What is the current market size and trends? What will be the market size during the forecast period? How various market factors such as a driver, restraints, and opportunity impact the market?